Brant is a great guy to deal with. Very knowledgeable and understanding. Definitely would recommend him to anyone. Will not be hesitating to deal with him again! I have attached a few photos of how everything looks and boy does it look great. So far everything is working and the higher center of gravity is actually very nice since the trailer is basically under the machine it makes it great for washing and waxing it since everything is almost at chest level. Anyhow I’m very pleased with the end result and thanks again for designing and producing a great trailer. Thanks for a great trailer. I bought 2 flat bed trailers from you last year. 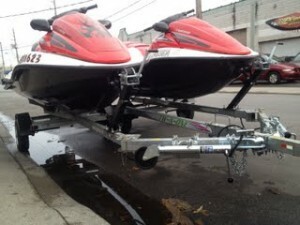 Have been using it to tow my jet ski multiple times, as well as jet ski with my motorcycle on it. Also used it for several construction projects. Love the versatility. Check out this great product! Gene and I have been using our tw-n-one combo all summer. 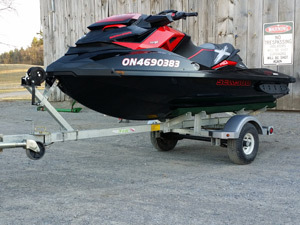 It’s the perfect solution for hauling the seadoo and the building materials without having to take two cars or sacrificing time on the water during our down time. There are many different options including attachable single trailers to make a double trailer. I have two eight foot doors on my garage, and most two-place trailers won’t fit through them. 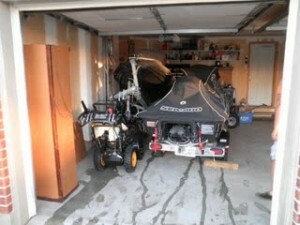 The Two-N-One trailer allows me to store my machines on one side of my garage, with plenty of room for another car, a lawnmower and a snow blower. 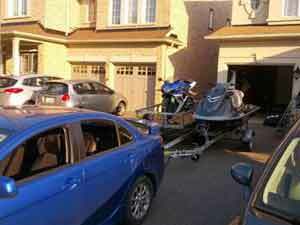 Even if I had a larger door, a regular two-place trailer would not allow for another car to fit beside it. My Two-N-One trailer gets pulled often, and I was amazed at how light it pulls. Having two extra wheels on the ground really makes a difference in the ease of pulling, and stability at highway speeds. It just feels safer to pull than my old two-place trailer. I have used it several times. No problems at all. 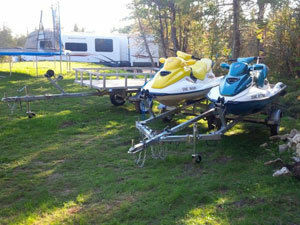 We have also used it to tow a Sea Doo. Single trailer. I just wanted to thank you again for the production of the two in one trailers. I am a super satisfied owner and would recommend this product to everyone. Theses trailers are built to last, will hold any machine I throw on it with ease. I was in the market for a conventional trailer, until I realized the dual trailer was too wide for my garage. Not a problem for the two in one . Now my machines are safe in tow and in my garage at night. The two in one trailers are slightly more expensive, but well worth the investment, for the engineering, and benefits they offer… Thanks again…Keep up the great work! Everything is great! I take it out every weekend. Thanks a lot the trailer works beautiful. I’ve been out almost daily and have had no issues Thanks. The ability to store my machines in my own garage is huge for me. It saves me about one thousand dollars per year versus a storage yard, and I have the peace of mind, knowing where my machines are at all times.” “At my cottage, the boat launch is about 4 miles away. 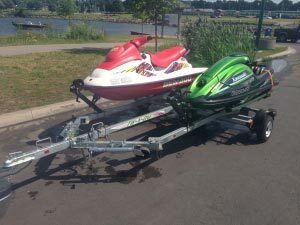 With the Two-N-One trailer, I can tow both machines to the cottage, then separate them, and launch them from the beach one by one, by hand. 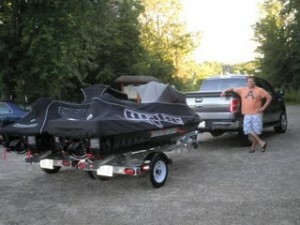 Now my truck can stay at the cottage and be used, and not have to sit at the boat launch all day long. 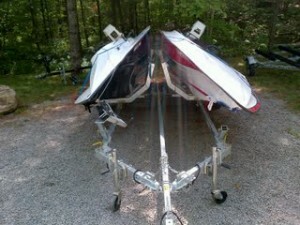 The Two-N-One trailer is very easy and quick to detach and reattach. I can have them pulled out of my garage, and attached together in under ten minutes. 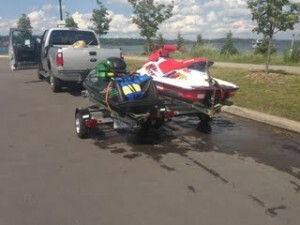 This allows my family to be on the water longer, with almost no preparation time.